Get your last minute shopping done during Thursday’s Historic Holiday Nights in Old City, then walk over to the ‘Twelve Days of Christmas Movies’ at the Blue Cross RiverRink Winterfest. P.S. With a valid student ID, get free skate admission at the rink Monday – Thursday until December 21st. Skate rental not included. Celebrate the holiday season Bossa Nova-style on Friday Night at the Philadelphia Museum of Art. Take your laptop to your favorite coffee shop and start your spring internship search by creating your free Launch profile at campusphilly.org/launch. There are hundreds of local jobs and internships for you to apply to. See the sights and lights all around the city! Here are 8 Festive Events Happening in Philly Right Now. Wheel around the city on Wednesday at the Bicycle Coalitions’ Holiday Lights Ride. The ‘best-spirited costume’ will receive fun prizes! On Thursday, head to Historic Holiday Nights in Old City, then walk over to the ‘Twelve Days of Christmas Movies’ at the Blue Cross RiverRink Winterfest. P.S. With a valid student ID, get free skate admission at the rink Monday – Thursday until December 21st. Skate rental not included. Snack, shop and see the newest exhibit at Friday’s Open House: Pop-up Holiday Market at the Barnes. Handmade and vintage treasures are waiting to be found at the Punk Rock Flea Market, happening Saturday and Sunday at the BOK in South Philly. Looking for more? Check out Eight Festive Events Happening in Philly and our jam-packed calendar! The Semester is Coming to a Close, and Philadelphia Festivities Are Just Beginning! While your semester is winding down, Philadelphia is going full-steam-ahead into the holiday season! From local holiday markets to free museum days, here are some ways to take a study break and enjoy Philadelphia in its festive glory. Channel your inner Olympic champion by bringing your best moves to the ice at Blue Cross RiverRink Winterfest. With a valid student ID, get free skate admission at the rink Monday through Thursday until December 21st. Skate rental not included. Planning to shop til you drop this Saturday? Refuel with sweet treats at the Crepes and Cocoa Pop-Up near a.kitchen, 135 S. 18th St.
Run, run Rudolph! Lace up your sneakers for Saturday’s free Rudolph Run in Manayunk. Head to Old City for Saturday’s Philly Holiday Festival’s Free Museum Day at National Liberty Museum. After, browse the unique Old City boutiques or stop by Franklin Fountain for their Holiday Hot Fudge Sundae. On Tuesday night, watch the ’90s classic, “Home Alone,” on the big screen at PFS Roxy. No need to get dressed up for the occasion. The holiday movie screening will also be a pizza and pajama party…students receive a discount. Get your bike ready to ride and shine for the Bicycle Coalitions’ Holiday Lights Ride on Wednesday. The ‘best-spirited costume’ will receive fun prizes! Looking for more? Check out Eight Festive Events Happening in Philly and our Campus Philly calendar. Your upcoming winter break is the perfect time to lock down your spring internship! Create your free Launch account at campusphilly.org/launch to check out hundreds of local gigs like the ones featured in our Top 5 picks. It’s the most wonderful time of year in Philadelphia! These “8 Festive Events Happening in Philly Right Now” are happening all month long so check ’em out. If you want to find unique gifts for your friends and family and support local artists and makers, check out these upcoming holiday markets. RSVP to the Inclusive Leadership Conference! This popular event takes place on Saturday, February 3, 10AM – 4PM, at Temple University’s Howard Gittis Student Center. Looking for more? Our calendar is a great resource for planning your Philadelphia adventure! With all the upcoming holiday markets happening this month, it will be easy to find something for everyone on your list! Check out our picks below and visit our calendar page for more things to do around the city. Stroll along the festive Germantown Avenue and enjoy extended store hours (until 9 PM) along with holiday sales and promotions throughout the Chestnut Hill shopping district. A holiday makers market featuring handmade wares from over 80 makers, artists, and crafters. Preview our vendors here. The first 100 shoppers will receive a tote bag from Occasionette filled with goodies from our vendors!! Lume Creative and The Art Dept will host Make and Take tables highlighting handmade holiday crafts. 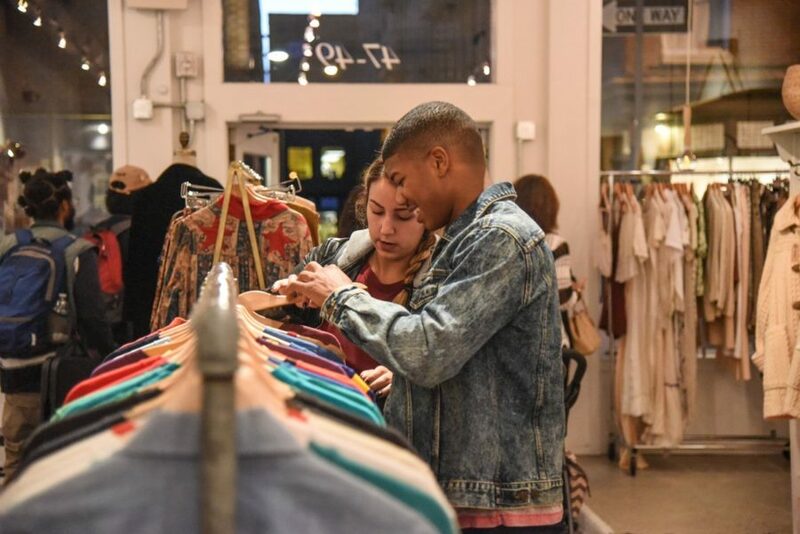 Touted as the “best annual holiday party in South Philadelphia,” the Brigade is a shopping event featuring affordable and original artwork & gifts by local artists. Glass, ceramics, jewelry, clothing, housewares, and more! More than 30 vendors curated by Shannon Maldonado, founder of YOWIE. Twenty-five Philly Small Press Faire vendors, DIY workshops for adults plus more! Featuring free admission to the Barnes collection and Kiefer Rodin exhibition! This holiday market is a great, one-stop-shop for interesting artsy and eco-friendly gifts, including cool apparel, handmade jewelry and artisanal goods. Visitors will also have access to art after hours, and winter-inspired spirits and gastro fare, including complimentary treats from Whole Foods. The Punk Rock Flea Market returns with the 2017 Holiday Edition! Over 100 vendors per day, different vendors each day! $3 to enter, entry good for both days. The event is in the Boy’s Gym of the BOK building, enter on Mifflin St.
It’s beginning to look like the holiday season in Philadelphia! From festive light shows to ice skating, we’ve been adding tons of awesome holiday happenings to our calendar. Below are just some of the events we’ve handpicked for college students to check out this month. For the 21-plus crowd, the Winter Beer Garden will be open in the evenings. Gather by the outdoor fire pits to drink craft beers, wine and specialty cocktails. Modeled after traditional European open-air Christmas markets, Christmas Village in Philadelphia is a daily outdoor holiday market selling all sorts of gift-able items right in the heart of Center City. Marvel at more than 50,000 lights as they shimmer, dance, and illuminate the Square to a soundtrack of holiday classics. Every evening, one lucky audience member will be selected to “ignite” the 4:30 pm show. More than 50 participating boutiques, shops, art galleries, museums, salons, spas, restaurants and cafes around the neighborhood will treat visitors to special sales, discounts, promotions, seasonal cocktails, added menu items, special events and extended hours. Now until December 31 | 10 a.m., 12 p.m., 2 p.m., 4 p.m., 6 p.m. and 8 p.m.
Take a stroll down the 1600 Block of South 13th Street (between Tasker & Morris) and enjoy Philadelphia’s favorite holiday display! Center City District, in collaboration with 6abc, brings City Hall to life this holiday season with a FREE nightly choreographed light show, projected onto Philadelphia’s Historic City Hall. 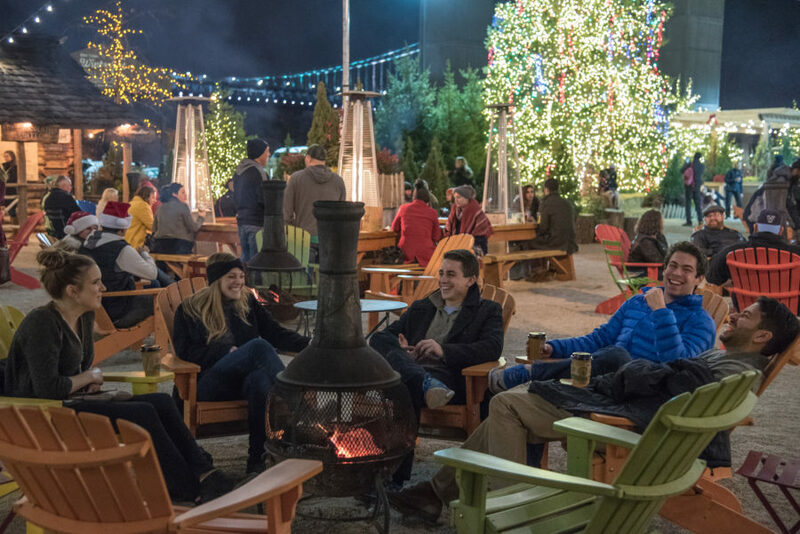 This seasonal winter park includes a beautifully lit landscape featuring a majestic holiday tree, outdoor seating area with fire pits, cozy warming cabins, the Franklin Fountain Confectionary Cabin, and a chalet-inspired Lodge with food and beverages from local restauranteurs. Find Your Spring Internship, Get on the List for an Awesome Conference + Check out Local Holiday Happenings! Believe it or not, it’s time to lock down that spring internship! Create your free Launch account at campusphilly.org/launch to check out hundreds of local gigs like the ones featured in our Top 5 picks. Bookmark the Inclusive Leadership Conference registration page. Starting this Friday, December 1, you can RSVP to this free, all-day conference happening on Saturday, February 3 at Temple University’s Howard Gittis Student Center. ‘Tis the season for tree lightings, holiday markets and parties! On Tuesday, November 28, you can catch the Christmas Tree Lighting in Rittenhouse Square. Thursday night looks like the perfect time to get a little holiday shopping at the opening night of Historic Holiday Nights in Old City! 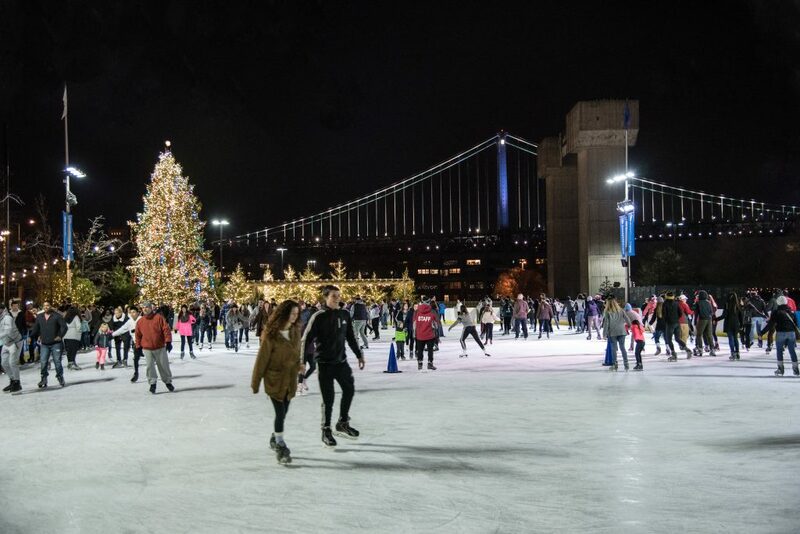 And lace up your ice skates and coast into the weekend at Friday’s tree lighting at the Blue Cross RiverRink. Get more ideas for fun holiday activities by checking out our picks for Holiday Happenings and Holiday Lights in Philadelphia. Looking for more local events? 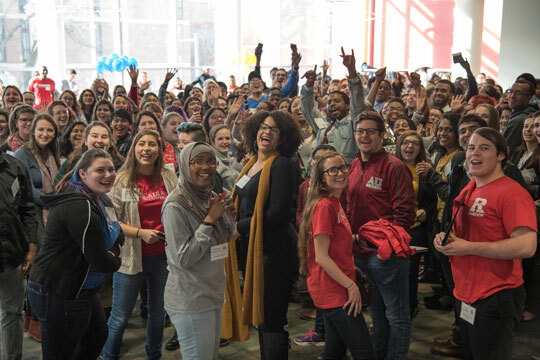 Check out Campus Philly’s event calendar, which has tons of events handpicked with college students in mind! No Classes This Week? More Time to Get Motivated! Fall break = more time to hang out, plan ahead and explore! Get motivated to find that dream internship for the spring semester and explore Philadelphia in all it’s holiday glory with our picks below. For the 21-plus crowd, the Winter Beer Garden will be open in the evenings. Gather by the outdoor fire pits to drink craft beers, wine and specialty cocktails. To eat, there will be empanadas, latkes, turkey legs, soup, churros, fried Oreos, pie and other bites from Squareburger. Ben’s Sweets & Treats also will be back, but with a new gourmet hot chocolate bar and s’more-making station. College students pay $2 admission to the Rothman Rink with student ID (skate rental not included). On Wednesdays, 21+’ers can enjoy the weekly Cocktails and Cold Ones event. Philadelphia’s largest outdoor ice skating rink and winter wonderland is open seven days a week, including all holidays. This seasonal winter park, includes a beautifully lit landscape featuring a majestic holiday tree, outdoor seating area with fire pits, cozy warming cabins, the Franklin Fountain Confectionary Cabin, and a chalet-inspired Lodge with food and beverages from local restauranteurs. The kickoff celebration will take place on Nov. 30 at 5PM at the Betsy Ross House courtyard (239 Arch Street) and will feature Betsy Ross, carolers, and the new Old City District Design Tree. Fezziwig’s Sweet Shoppe will offer seasonal sips and snacks. Visitors can enjoy $1 off admission at the Betsy Ross House, which will offer extended hours until 8:00 p.m.
Spiked hot chocolate, anyone? Grab your favorite ugly holiday sweater and have a drink with us in the Members’ Lounge. Find one of a kind holiday gifts for your family and friends at the The Punk Rock Flea Market! Over 100 vendors per day, different vendors each day! $3 to enter, entry good for both days. The event is in the Boy’s Gym of the BOK building, enter on Mifflin St.
Stroll along the festive Germantown Avenue and enjoy extended store hours (until 9 PM) along with holiday sales and promotions throughout the Chestnut Hill shopping district. Celebrate the season with live entertainment, seasonal treats, dazzling lights, and a visit from the jolly old elf, himself. The ceremony sets the 50-foot tree aglow and a new-this-year gift drive supports youth in the community. Toy and clothing donations will be accepted from 4 to 8 p.m.
Saturday, November 25 – December 31 | 10 a.m., 12 p.m., 2 p.m., 4 p.m., 6 p.m. and 8 p.m.
Kick-off the Rittenhouse holiday shopping season with family-friendly activities and music leading up to the lighting of the 30-foot holiday tree and white globe lights. The holiday park lights continue to be illuminated every night through the end of December. Celebrate the First Friday in December and usher in the holiday season with a full night of performers, singers, dancers, and ice skaters, with a grand tree lighting finale capped off by landside fireworks thanks to PECO’s sponsorship. Complete details including the list of performers TBA. A parade of local working boats will be illuminated in holiday lights for all to see on the Delaware River at 5:30 p.m. The best spot to take in this unique sight is from the Independence Seaport Museum’s second floor terrace. Warm seasonal beverages and food will be available in our Holiday Hut.